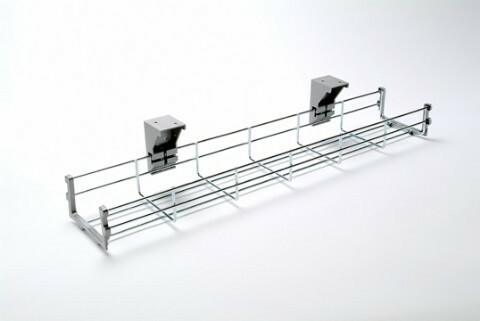 A Wire Cable Basket for under desk cable management. Made from metal it comes with matching plastic fixings to allow full access to one side of the basket and supplied with self-drilling screws. Supplied brackets have 2 sets of fixing holes, meaning you can either attach to the underside of top, or to a vertical surface. 2 end caps also come fitted to the basket which match the brackets and finish off the ends nicely. Other sizes may be available upon request � Subject to MOQs.